Priority Pass, the airport lounge network which offers access to 850 lounges worldwide, rolled out the final stage of its relaunch yesterday. 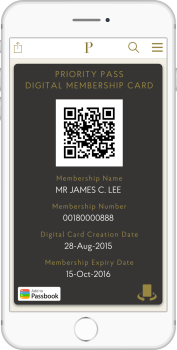 As part of this – and I think this is a relatively new feature – Priority Pass is now offering a digital membership card via its app. If you pay to join Priority Pass (plans start at £69) you can access lounges immediately by using the digital card. The app is even available for a Blackberry which will please my wife. You no longer need to worry about packing your plastic card as long as you have your smartphone with you. To be 100% fair, the Priority Pass website does say that the ‘majority’ of lounges are accepting the digital membership card but that you should carry the plastic card for 100% certainty. You can use the digital card even if your Priority Pass is provided free with your American Express Platinum. You need to have a username so – even if you registered for the old version of the Priority Pass website which worked via your membership number – you need to re-register to set up a username. It only took me a few seconds to do this and I was then able to download the app and log in. If you have a Priority Pass card, I recommend that you download the app now even if you have no immediate plans to use it. You never know when you will be in an airport and decide you want to use your pass – even if you have lounge access already, you might decide the Priority Pass option is better! BA Gatwick £150 Club Europe sale - add a hotel or car for £2 to £6 per night! The new app has a symbol in the ‘Facilities’ section for each lounge to indicate whether the digital card is accepted although I haven’t tried it yet. In attempting to register on the app, after entering my membership card number, I’m asked for a PIN which it says was on the welcome letter! And if I don’t have the letter any longer then I must contact them. Great. Only took a couple of moments to phone and get the pin. Airport Angel have done this for years. Shame they’re going! When are airport Angel going?? I would definitely take the plastic card with you if you are travelling over the next couple of weeks as it beds in as when I tried to use the app in Edinburgh last week they did not know what to do with it! Well, I already have the app (Android) and have now set up an account on the website. Have just logged into the app (it has been updated) with my new credentials but nowhere can I see a digital card. The menu has options for Home, Favorites, News, FAQs, Settings and Contact Us. I’ve been into all these screens but am obviously missing something! Can someone please point me to where the digital card is located within the app? I’m having the same issue…..? The last few times – the first was due to me taking my wife’s card by mistake – I have just showed them a photo of my card! Looks like the free PP that comes with a NatWest Black account can’t set up online account so this isn’t available. Anyone else find this? Yeah I tried mine, no success! “Thank you for visiting the Priority Pass website. As a NatWest Black Account holder, you are not able to login to the Priority Pass website as all the information you need to make the most of your Priority Pass membership is available on the Natwest Membership Benefits website, at https://membershipbenefits.natwest.com. “About Head for Points” Lol. Not sure what this is about, but it sounds interesting!